This multiplayer first-person shooter video game has been developed by Hidden Path Entertainment and Valve Corporation. It was released in 2012 and is suitable for Microsoft Windows, OS X, PlayStation 3, Xbox 360 and Linux platforms. It is the fourth game in the Counter-Strike series of games and pits The Terrorists and the Counter-Terrorists against each other. The aim is to eliminate the opposition while completing a number of different tasks. The game features six games modes, each with their own distinct characteristics. This game is a free-to-play multiplayer online battle arena (MOBA) video game that has been developed and published by Valve Corporation. It's a stand-alone sequel to the popular game Defence of the Ancients. Gameplay requires two teams of five players. The teams each occupy and defend their own separate bases on a map. Players are able to independently control their own characters, each with unique abilities and differing styles of play. Experience points and items are collected during a match to help the heroes battle their opposing team's heroes. League of Legends is a multiplayer online battle arena video game developed and published by Riot Games. It was created for Microsoft Windows and MacOS. In the game a player is able to play the role of an unseen summoner and control a champion with unique abilities. This champion then battles a team of other players or champions controlled by the computer. The aim of the game is to destroy a structure, known as the 'nexus', that belongs to the opposing team. The champions are very weak at the outset of the game but increase in strength by the gathering of items and experience during the game. This is the second game in the StarCraft video game series and includes a number of separate expansion packs that can be played. These include Wings of Liberty that was released in July 2010. StarCraft II: Heart of the Swarm that was released in March 2013. and the Legacy of the Void instalment that was released in November 2015. The StarCraft II series of games were released as official sequels to StarCraft, for Windows and MacOS. The games feature a new 3D graphics engine and exciting new features as well as DirectX 10 level effects in Windows. It was supposed to be just one game but was eventually developed as a base game and two expansion packs. This series of multi-player first-person shooter video games features teams of terrorists and counter-terrorists battling to either perpetrate an act of terror or prevent it. The first version of the series appeared for Windows in 1999. Further additional games were released along with a number of community-made spin-off titles. Players are rewarded based on individual performances by way of in-game currency that can be spent on more powerful weapons if the following rounds. The latest game in the series was released in 2014, Counter-Strike Nexon:Zombies. This is an expansion pack for the real time strategy game, StarCraft. It was released in 1998 for Microsoft Windows and MacOS. Saffire Corporation and Blizzard Entertainment came together to develop the game featuring new campaigns, map tilesets, music, upgrade advancements and extra units for each race. The game takes the story on from the original StarCraft game and where it ended. And the Wings of Liberty sequel continues the story even further. This expansion pack has been well received by players, especially in South Korea where it's being played by professionals and teams in televised matches. Published by Microsoft Studios and developed by 343 Industries, this first-person shooter video game was made for the Xbox One home video game console. It was released around the world in October 2015. The plot of the game involves two fireteams of human supersoldiers. There is the Blue Team led by MasterChief and the Fireteam Osiris, led by Spartan Locke. The game uses motion capture, like Halo 4, for the character animation as well as new abilities and character designs. The game has received positive reviews from critics, in particular for its gameplay, level design, visuals and multiplayer modes. Developed by Infinity Ward and published by Activision, Infinite Warfare is the 13th primary instalment in the Call of Duty series. It was released in November 2016, for Microsoft Windows, Xbox One and PlayStation 4. It's a first-person shooter video game that can be played in single or multiplayer mode. The gameplay centres around a battle for the Solar System. And the new setting introduces a zero-gravity environment, that can be navigated with the help of a boost pack and grappling hook. Players are able to visit different planets, satellites and asteroids in the virtual solar system. The game has received very positive reviews in particular for the single-player campaign that was considered to be a big improvement over the game's predecessor. Heroes of the Storm is a multiplayer online battle arena video game that has been developed and published by Blizzard Entertainment. Released in June 2015 for Microsoft Windows and MacOS, it features heroes from other Blizzard franchises such as Warcraft, Diablo, The Lost Vikings and StarCraft. Free-to-play and freemium models are used and micropayments can be used to purchase heroes, mounts and visual alterations for the games heroes. Currently, there are 71 heroes in the game and these are divided into either assassin, warrior, support, specialist and one Multiclass hero. There are 13 maps to play. Each map has different objectives to secure and some have different victory conditions. Developed and published by Blizzard Entertainment, Hearthstone had a worldwide release in March 2014. The game builds upon the existing lore of the Warcraft series. It uses the same elements, characters and relics. Originally, it was released for Microsoft Windows and MacOS but later became available for iOS and Android devices. Cross-platform play is a feature which means that players on any device can compete against each other. This is a turn-based card game between two opponents, using decks of 30 cards. Players are able to cast spells or summon minions. The ultimate goal is to reduce an opponents health to zero. Hearthstone was originally an experimental game but the reviews were so favourable and the game so popular that it's now played at various eSporting events. Tournaments and eSports leagues have been held for a number of years. But those that are held nowadays are a world away from the early days. 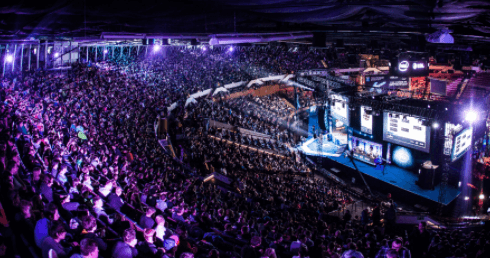 Interest in eSports has gained momentum recently and bigger and bigger audiences are being attracted. Contests used to be held in small venues but now are held in major sporting venues such as Wembley Arena in London, the Staples Centre in Los Angeles and even Madison Square Gardens. And it's not just live audiences that have been increasing. Many more are watching online and there are even dedicated TV channels. Bigger audiences of course means bigger prize pools. It's now very common for competitions to be worth millions. Keeping track of all that's going on is not easy. The eSports scene changes on a regular basis. We're providing on this page, details of some of the biggest leagues and tournaments you can expect to enjoy currently. We'll keep the list updated as and when we hear of something new.